You are made for worship. You are designed to experience the glory and greatness of God in His creation and delight in Him with all your heart, soul, mind and strength. We worship as a community to hear God’s Word, to sing and pray, to share our lives, and to experience God’s grace and glory through His gifts in worship. After we worship together we go back into the world better strengthened to display the love of God for all people wherever we are in the week ahead. Through worship the power of the living Jesus leads us into living lives that are more like his. Worship at LWF is relaxed and contemporary in style. Worship Services are held each Sunday at 10am (with special services for Christmas and Easter). 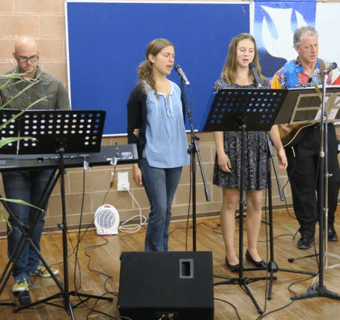 Our music reflects the contemporary style of our worship, and is led each week by an ensemble or band. Children are a wonderful part of worship at LWF and are invited to worship with their families/caregivers. Worship services include a ‘Children’s Time.’ Activity sheets are available to help engage busy hands and minds. We have a space in our worship area that is set aside just for kids and parents who want to be close to their little ones. Holy Communion is served regularly at Sunday worship services. We invite all people who wish to receive Christ’s gift of forgiveness, life and salvation as they feel led in faith to do so. Living Water is a congregation where we welcome all people wherever they are on their spiritual journey. We hope you feel like you can belong even if you have doubts about your faith relationship with Jesus Christ. We are patient. The Christian faith is not about a set of intellectual propositions, or list of rules. Faith is about entering a life-giving relationship with the God of the universe who loves you so much that he sent his Son to save you. 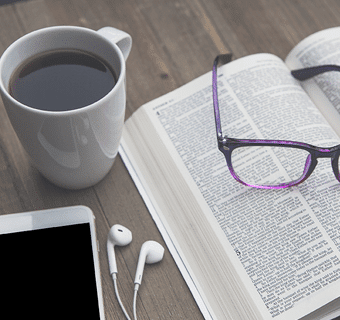 Serving beyond ourselves and Growing in God’s Word are the themes for the many different group/ministries adults, youth and children are invited to participate in. Care and Share is a daytime friendship group, meeting to knit, crochet and create gifts for those in need. Saintly Sowers is an evening friendship group, meeting to sew and create. Stewarding at worship services on Sundays involves preparation of the worship environment, welcoming people and the provision of food and hospitality. Singles, couples and families are all welcome to be a part of our stewardship teams. Musicians and singers together with readers, prayers, Communion assistants and technical assistants help lead worship. Offers of assistance are most welcome. A team of volunteers provide meals, transport, hospital visits and other assistance to those in need. The ‘Giving Beyond Ourselves’ giving plan is a commitment to giving for mission.Our focus is on four key areas of need – Local, Crisis Care, Global and LCMC . 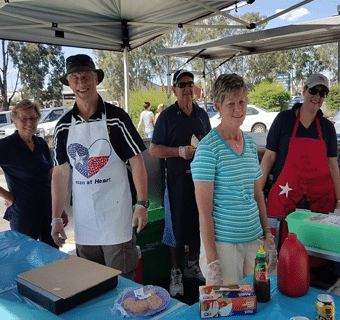 Past mission giving has been directed to the Charles Sturt University Ministry Apprenticeship Program, Riding for the Disabled, the Cancer Council, Phillipines Disaster Relief, Kooringal Girl Guides, Warrambui Retreat and Conference Centre and Turning Point Ministries. Ladies Fellowship is a daytime meeting for Bible study, lunch and friendship. Small/Home groups are regular meetings for book/Bible studies and activities. Kids time in Worship is a fun time of teaching and doing. Life Transformation Groups are groups of 2-4 who meet weekly to read the Bible intentionally, pray for souls strategically and be accountable in their walk with God. Impact Youth meets weekly during school terms for fun and friendship, and to grow through Bible/book study and activities.